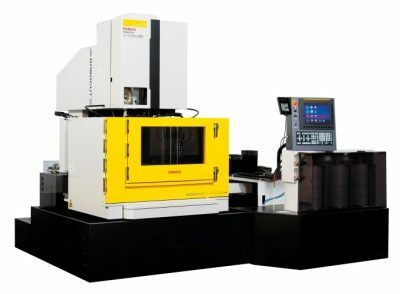 FANUC CORPORATION (hereinafter, FANUC) in collaboration with Preferred Networks, Inc. (hereinafter, PFN) has developed an AI thermal displacement compensation function which will improve the machining accuracy of ROBOCUT α-CiB series, FANUC’s wire-cut electric discharge machine (see Note 1 below). ROBOCUT with this function will be the first product using AI since FANUC and PFN began collaborating. FANUC and PFN formed an R&D alliance*1 in June 2015, followed by a capital alliance*2 in August of the same year to promote a joint development of AI functions for the manufacturing industry that can efficiently improve the performance and operation rates of FANUC products. The newly developed function utilizes machine-learning (ML) technology to predict and control the variable machining accuracy caused by ROBOCUT’s temperature fluctuations, with 30% more accurate compensation than existing method. The new function is applicable from small to large workpieces. The AI thermal displacement compensation function will be provided as an optional function to ROBOCUT, and FANUC plans to start accepting orders in November of this year. FANUC will also display the ROBOCUT with this new function at Mechatronics Technology Japan, which will be held in Port Messe Nagoya on Oct. 18-21, 2017. FANUC is also developing a similar function for the ROBODRILL series that utilizes ML and expect to release it in the near future. FANUC and PFN will continue making gradual but steady progress towards realizing innovative manufacturing fields through AI. Note 1. Wire-cut EDM is a precision and fine shape machining tool that uses discharge phenomenon between the ultrathin wire electrode and the metal workpiece (electric conductor).